All weather hazards are possible today as a strong cold front will interact with increasing Gulf moisture and plenty of shear to bring a chance of severe weather to the area from this afternoon into Thursday morning. 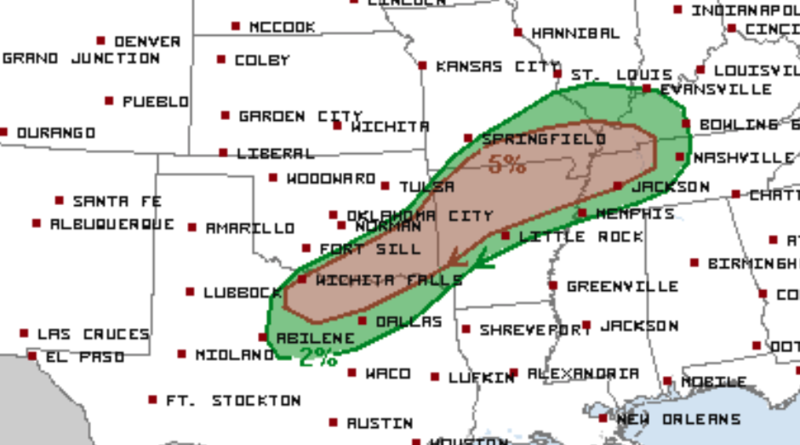 Besides the damaging wind and hail threat, tornadoes and flash flooding will also be possible. 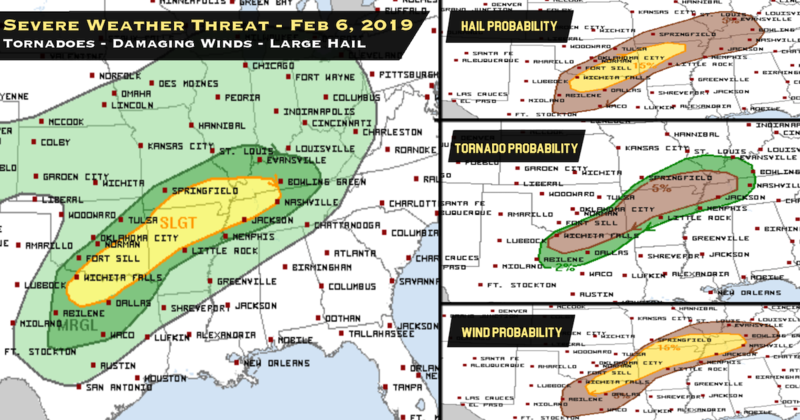 Episodic severe storms will be possible from parts of the southern Great Plains into the Tennessee and Lower Ohio Valleys, mainly from late afternoon through tonight. 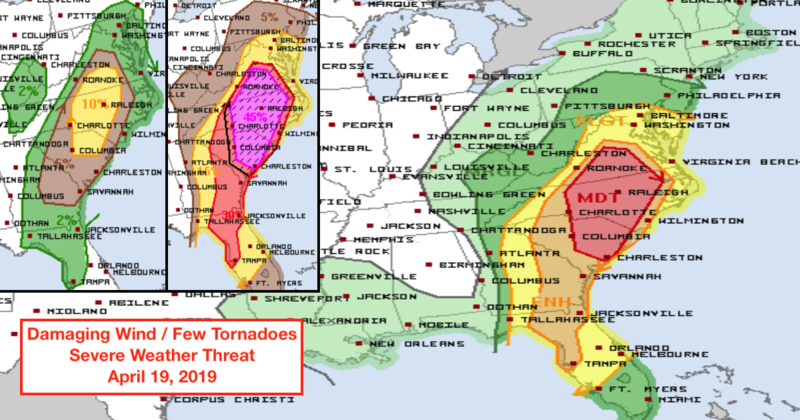 Damaging winds, large hail are the greatest risks, however, tornadoes will also be very possible. More Details Available at the end of this blog! 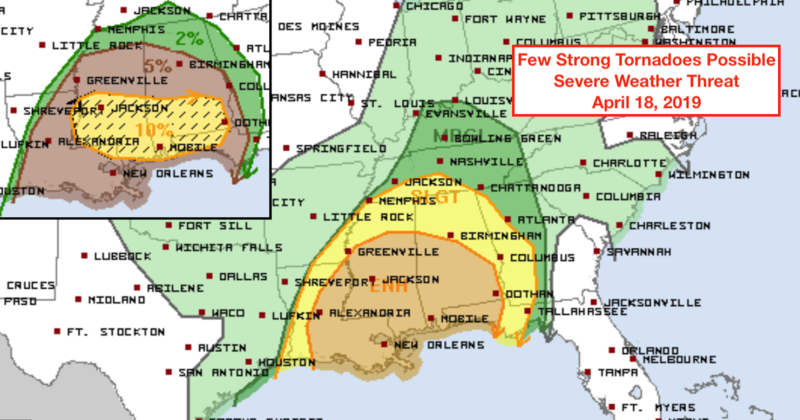 …Southern Great Plains to TN/Lower OH Valleys… A messy, relatively low confidence scenario for severe storms is apparent this afternoon through tonight, resulting in maintenance of risk area shape but with an overall southward shift. Have decreased wind/tor probabilities across the northern portion of the risk areas where the polar air mass is likely to remain entrenched. 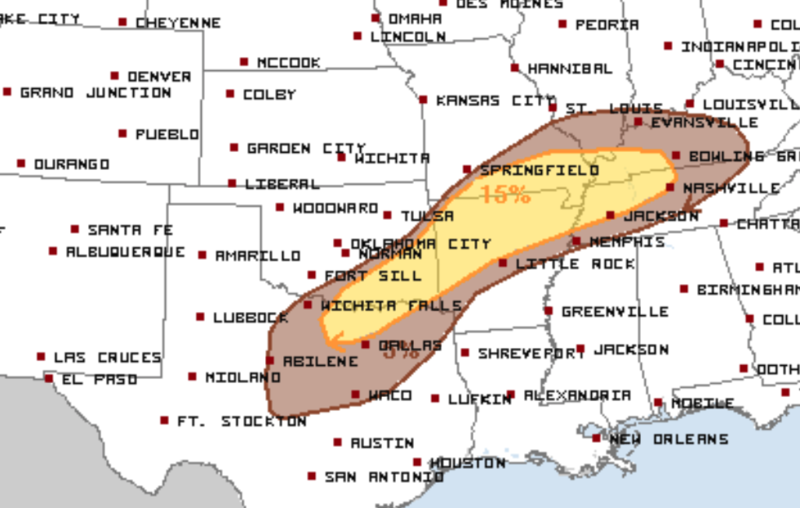 Have increased hail probabilities in magnitude and spatially given the expectation of at least a few supercells this afternoon/evening and for the incipient stage of storm development tonight in the southern Great Plains. The surface front has remained nearly stationary in an arc across northwest TX and far southeast OK, with the portion across AR/MO still sinking south with weak cold advection behind it. This boundary should fully stall by midday with some drift back to the northwest as cyclogenesis occurs in the lee of the southern Rockies. A series of cyclones should develop southeast along the front across the TX Panhandle into far south-central OK through tonight, before consolidating near the AR/MO border by 12Z Thursday. Isentropic ascent/warm advection near the boundary along with weak boundary-layer heating of a warm sector characterized by mid 60s surface dew points should promote scattered thunderstorms along and north of the front through early evening in an arc from southeast OK to TN/KY. 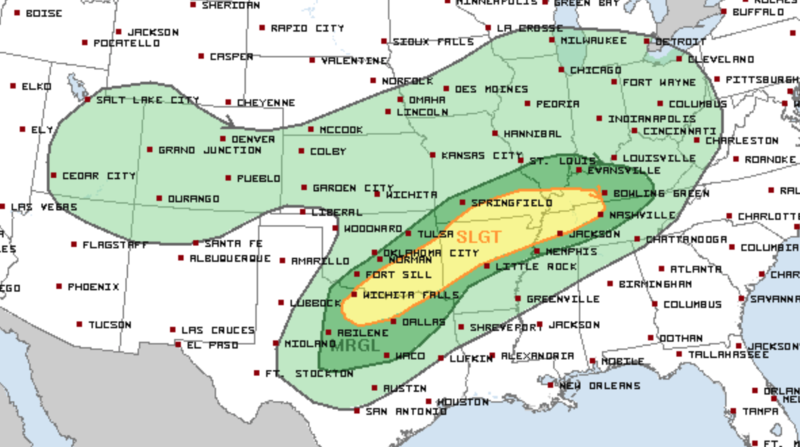 While elongated hodographs should support a few embedded supercell structures later today, seasonably modest low-level winds and mid-level lapse rates may curtail a more robust tornado and severe threat. Along the western portion of the warm sector in central TX to far south-central OK, the 10Z HRRR is an outlier with the depiction of intense supercell development near/north of the triple-point region along the Red River. This scenario while seemingly unlikely is possible given strengthening convergence associated with cyclogenesis. 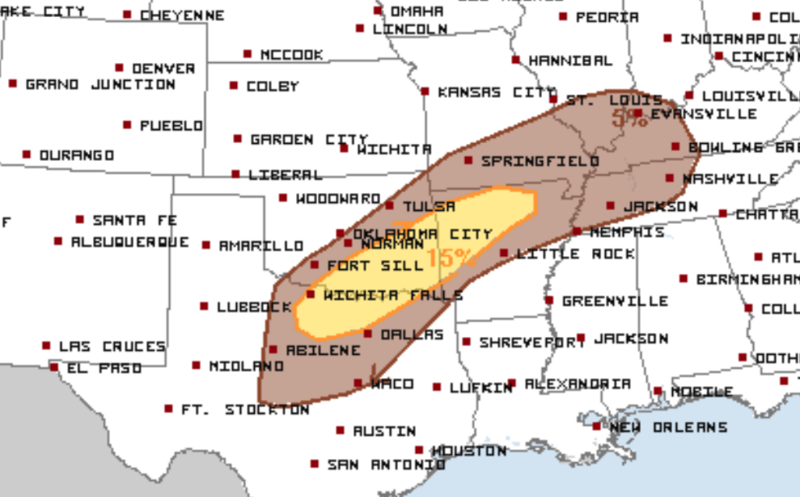 Should this occur and a discrete cell or two are able to deviate along the boundary, wind profiles would be highly favorable for a large hail and tornado threat. 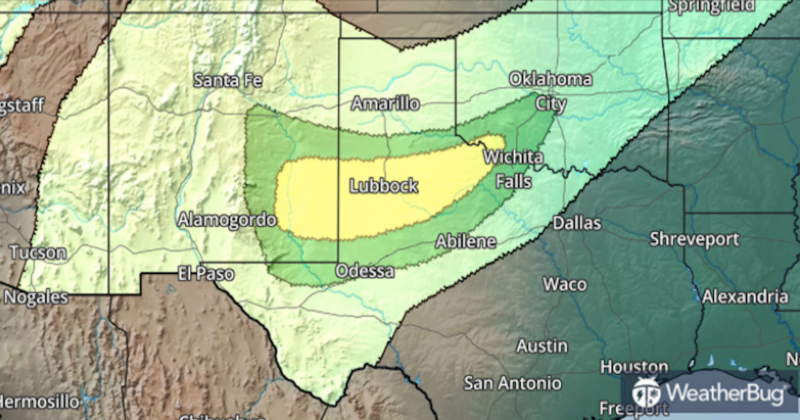 While other CAMs do not support this scenario, as mid-level height falls finally begin to overspread the region, scattered convection should develop generally on the cool side of the boundary in OK tonight and eventually southward along the developing cold front/remnant dryline into north-central TX. Clusters evolving into broader line segments appear probable overnight as forcing for ascent intensifies, but a strong cap should largely inhibit open warm-sector storm development. In addition, the southern extent of storms should struggle given the track of the shortwave trough from the southern Rockies towards the MO Valley. Still, strengthening low/deep-layer shear could sustain an isolated severe risk overnight.